The villa we rented for the family reunion. It was pretty awesome. 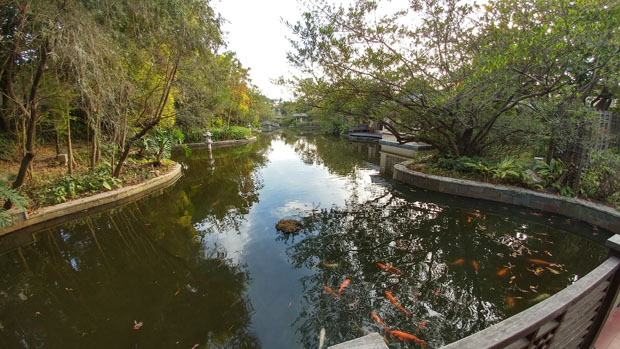 The koi pond next to our villa. The big family reunion we had took place in Zhongshan, which is the city just north of Zhuhai. We rented a villa in the Zhongshan Hot Spring Resorts. Our villa had its own courtyard, concierge, private karaoke room, and a hot tub fed by the hot springs. It was also at the edge of a koi pond with plenty of koi for us to feed. In other words, the villa was pretty awesome and we spent our evenings singing the night away in the karoake room. One of the most extravagant meals I’ve ever had. 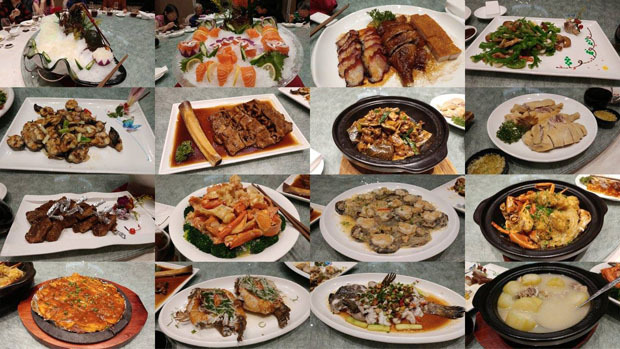 Probably won’t be able to find food like this in North America other than in the biggest Chinese enclaves. The resort is more than just our villa though. 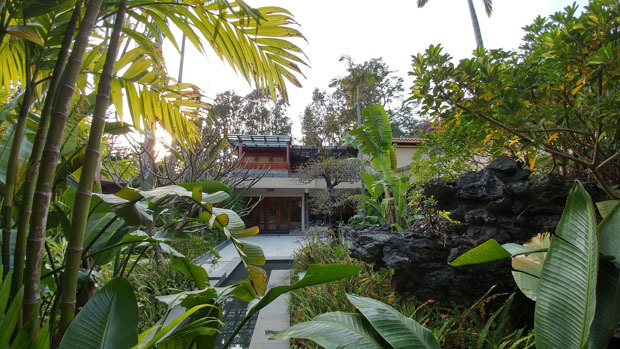 There were other villas, hotel rooms, an onsite restaurant or too, and a large hot spring complex for all resort guests. The main hot spring complex was the most impressive part of the resort. The centerpiece is a large pool (not a hot spring), but at the center of the pool and all around the pool there were dozens of hot spring pools for guests to soak their stress away. Many of the hot springs were scented: there was a mint pool, and a ginseng flavored pool. Some of them had massage jets. And there was one pool which had live minnows which will nibble off your dead skin. I’m not very ticklish so I found the minnow pool to be a fun experience. View of the main resort hot spring area from the pool at the top. 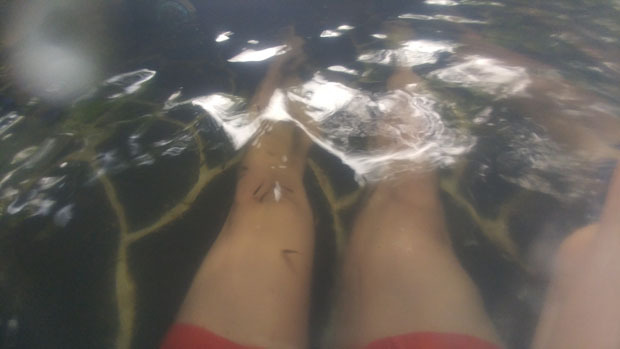 The minnow pool at Zhongshan hot springs. A memorable and unique experience for those who are not too ticklish. 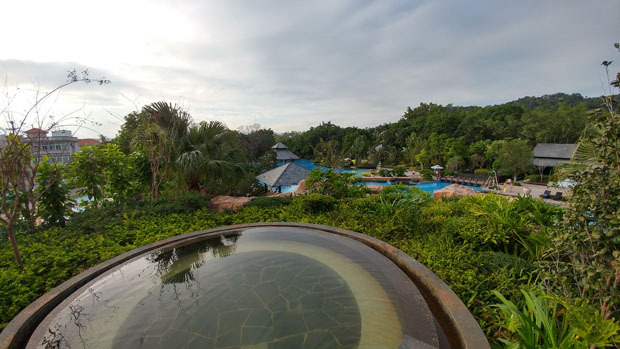 The Zhongshan Hot Spring Resort wasn’t only place we went to in the city. Zhongshan got its name from Sun Zhongshan, better known as as Sun Yat-Sun who was the first president of the Republic of China and a celebrated figure in modern Chinese history. 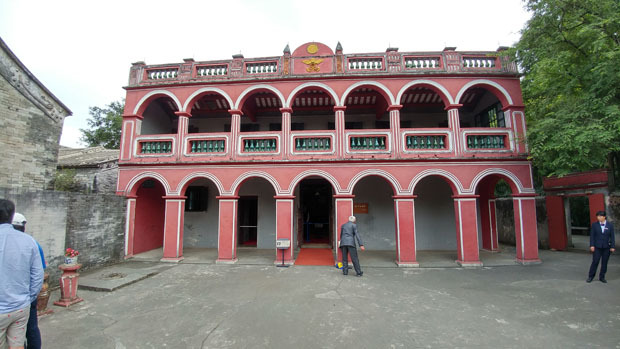 Sun Yat-Sun was born and raised in a village that is now part of city of Zhongshan, and that village has been preserved as the Sun Yat Sen’s Residence Memorial Museum. 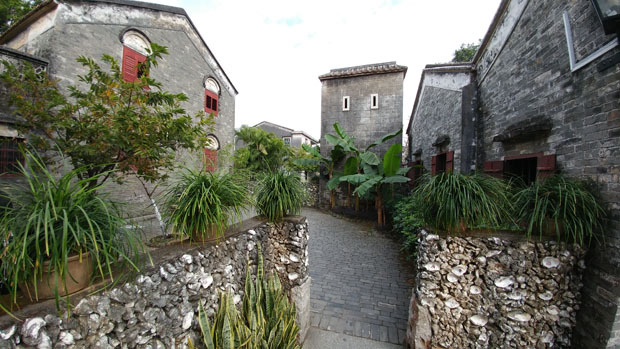 One can go see what an early 20th century rural Chinese village looks like, and go into the memorial and museum building to learn about how Sun Yat-Sun shaped the history of modern China. Reconstruction of the house Sun Yat-sen grew up in. Late 19th century/early 20th century village where Sun Yat-sen was raised. Like Zhuhai, Zhongshan is a developing city. Outside of the central urban area, there is plenty of rural settlements dotted with the occasional new condo development. We went down a rural road lined with countryside restaurants. 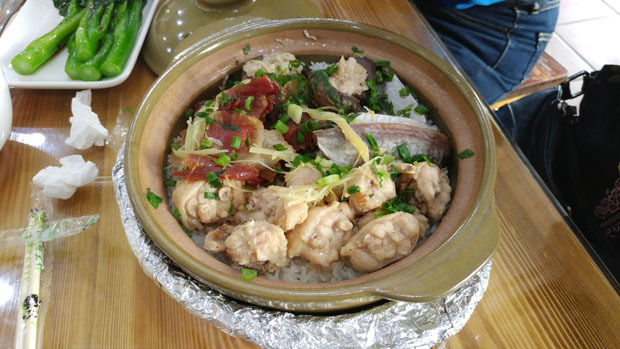 We ended up going to a place serving authentic and delicious claypot rice (another Cantonese staple) for only ¥18, which is only about $3 USD. You can definitely get really good and cheap food in China. While the food was good, along the same road we saw shantytowns where people lived in piss poor conditions. The standard of living in China has gotten better on average in the last 20 years due to the economic boom, but there are still plenty of economically disadvantaged people, particularly outside of the urban areas. It was just sad to see people living like that. While our main reason for traveling to China is to see family in Guangdong province, we also had family in the neighboring Guangxi Autonomous Region. When we were in China 7 years ago, we had to take a flight from Guangzhou to Nanning, but this time we took the high speed rail. 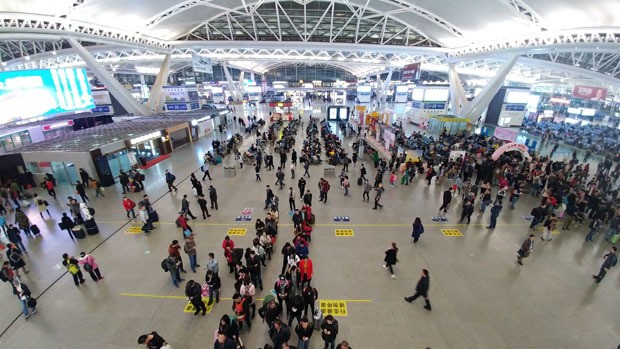 China’s growing high speed passenger rail network now offers a great alternative to flying, especially between places that are not that far away. Traveling between 200 – 300 km/hour, the trains are slower than flying, but they provide a more comfortable ride (larger seats, smoother operation), cheaper tickets, and better scheduling. Also getting through security at train stations is less hassle than the airports. Guangzhou’s South Railway Station is one of the largest in the country. Looks like an airport terminal. We went to Nanning to visit relatives. We didn’t do much touristy stuff, as we were only there for two days, and it rained most of the time. There were so many relatives and frankly I didn’t know who half of them were . After Nanning we took the high speed train again to the city of Guilin, also in the Guangxi province. Known for its unique mountainous scenery (properly known as karst topography), Guilin is one of the most well-known tourist destinations in China. Guilin definitely feels different than a mega-city like Guangzhou or even a mid-sized city like Nanning. For one thing, there are no buildings taller than about 10 stories in the urban area, and the reason is to not have the buildings block the scenery. During the high tourist seasons, the city is jam-packed, but we were visited during the low season, so there weren’t too many people around. Also being a tourist city, most of the attractions charged admission fees, and the ticket prices weren’t cheap. 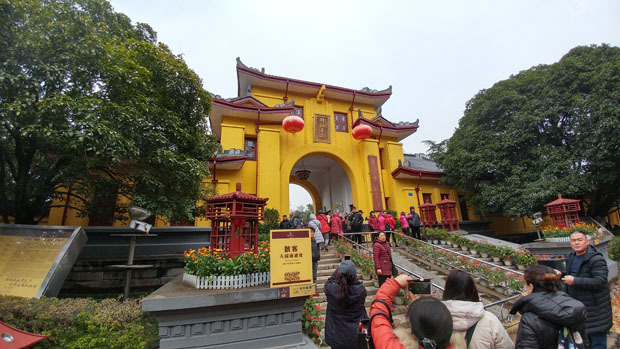 Entrance to the Jingjiang Prince Palace. All the buildings are painted bright yellow. We stayed near the city center and visited a few sights/sites within the city. The first was the Jingjiang Prince Palace. Originally built as the residence of the brother of the first Ming Dynasty Emperor, the compound has been used as an imperial exam site in the Qing dynasty, and a teacher’s college in modern China before being turned into a historic park. We took the tour through the compound and learned about its history. The most interesting part was taking part in a mock imperial exam which I was the top scorer . Other than the buildings in the compound (most of which were not original), there is the Solitary Beauty Peak that one can hike to the top. 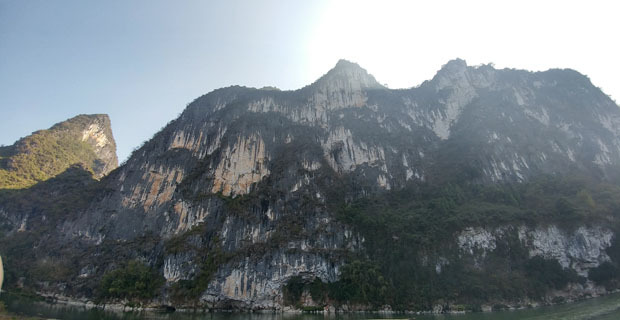 A perfect exam of the karst topography of the area, Solitary Beauty Peak rises 300 feet from the flat ground around it. 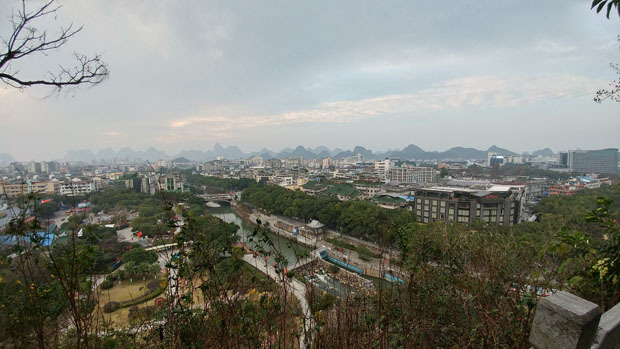 From the top, one can get a pretty good view of the entire city of Guilin. Do you think Elephant Trunk Hill looks like an elephant trunk? The view from the top of Elephant Trunk Hill are pretty good too. Within the city, we also visited the Elephant Trunk Hill Park. The namesake of the park is a nature arch that looks like an elephant dipping its trunk into the river. We also took a night cruise through the four man-made lakes in the middle of the city. The cruise was itself was not that special, but the Sun and Moon Pagodas lighting up the night with their orange and silver lights were a pretty sight to behold. 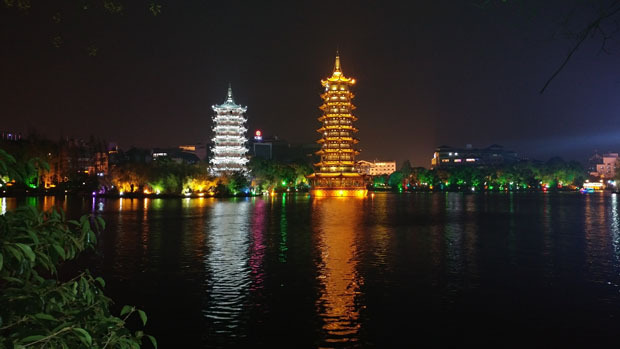 The Sun and Moon Pagodas light up the night in Guilin. Beautiful scenery along the Li River. 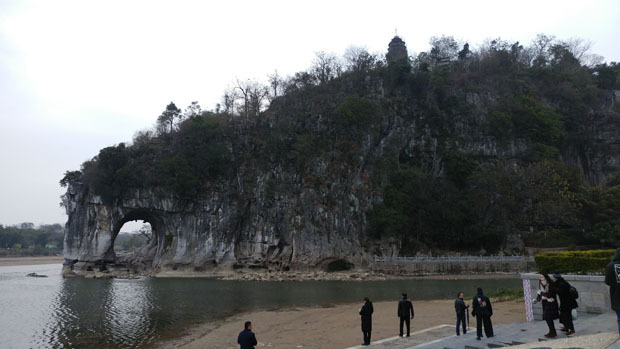 The classic Chinese saying of 桂林山水甲天下 says that Guilin has the best scenery under the heavens. Can’t say I disagree. Supposedly one can see the shape of nine horses on the face of this mountain. Can you pick them out? 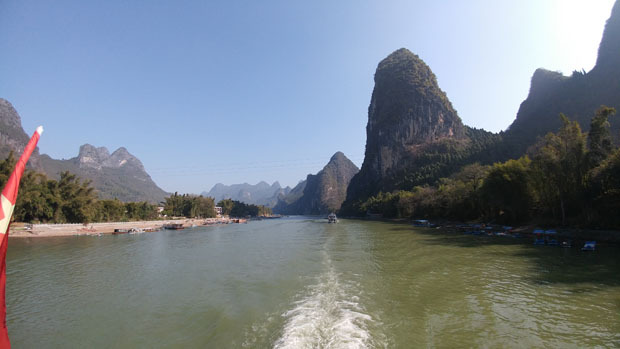 The classic thing for any first time visitor to Guilin (such as myself) is to take the cruise down the Li River. We did that on the second day. Our timing was fortunate because 1: the weather was great, and 2: if we had arrived a few days later, the length of the cruise would have been cut due to the low water levels in the river. So it worked out great for us. From the ship, one could get spectacular views of the countless peaks and interesting rock formations that just seem to sprout out of the ground. We had a great time and took plenty of photos during the cruise. 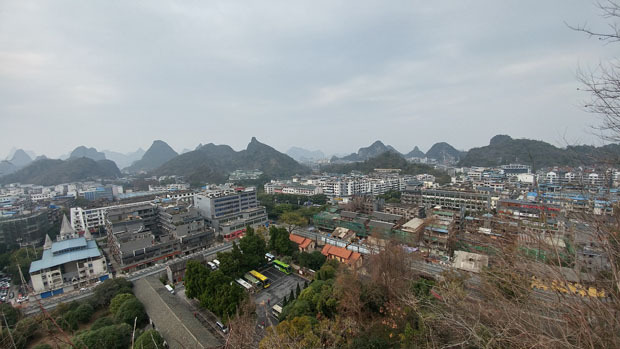 The cruise ended at the town of Yangshuo which is about 70 km south of Guilin. 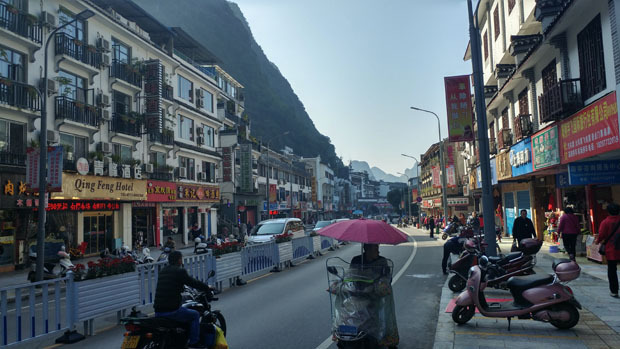 Yangshuo is a tourist town in the middle of the mountains, and there are markets and pedestrian streets selling crafts and local goods. The place is busy during the peak tourist seasons, but not too busy when we were there. The tourist town of Yangshuo at the end of the Li River cruise. 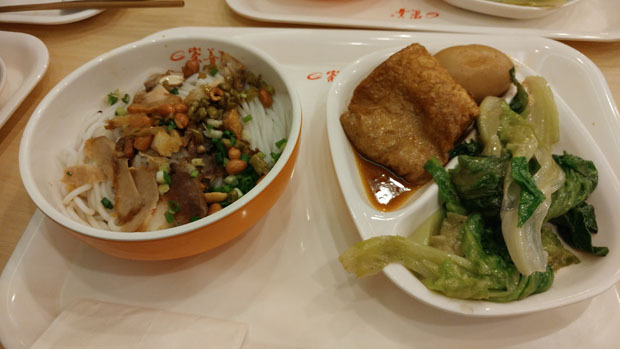 Guilin’s signature food item are its rice noodles. They are good for a cheap and light meal. It took me a while to write this post, since I did manage to do quite a few fun things despite spending only two weeks in China. Despite being sick for most of the trip, I consider this trip to be pretty good. It’s always good to visit family that you haven’t seen in a long time. As time goes on, it becomes harder to gather the extended family back together, so we have to cherish the opportunities we get. Also I ate a lot of good food (and got stomach aches for eating too much), and had fun being a tourist. I don’t know when is the next time I’ll be back in my country of birth, but hopefully I can visit a little more often. China is a huge country, and there are still many parts of it that I want to visit. – Definitely have tissues with you at all times. Many public washrooms do not supply toilet paper, and you’ll need something with which to wipe yourself. Most of the nicer, upscale places give toilet paper, but places like train stations and public parks tend not to. – I am glad I practiced my deep squats, because in China, most public washroom toilets are squat toilets. Some washroom may have one or two seated toilets. Only upscale restaurants may have all seated toilets. Thanks for reading, and happy traveling.